Our super line-up this week includes a debutante and someone who becomes the first player to rack up a sixth appearance and becomes our outright season leader. The guard actually posted two highly productive displays during a weekend win double for her team, but she gets the nod mainly for her efforts against Wolves. She put Oaklands to the sword and put Riders into the Trophy Semi-Finals with a stellar 20 points from 71% shooting and completed a sparkling double-double with 10 assists. The versatile Eduardo makes our starting five for the first time in her WBBL career after she helped Durham to bounce back from derby disappointment on Tyneside to rack up a pivotal victory at home against Pride. She was too hot to handle for Caledonia as she led Palatinates to victory with a stylish 21 points, 8 rebounds and 4 assists. The Mystics took their first win in the Trophy with a fruitful offensive effort last Saturday against Nottingham. Ovner was at the heart of the triumph as she showcased her range of skills and power with an eye-catching double-double. The forward finished the contest with 22 points and 14 rebounds, also grabbing a couple of steals. Sevenoaks Suns are into the Trophy Semi-Finals after shifting up a gear during the second-half of their clash at home to BA London Lions. Good did the business for Suns and was a driving force in them reaching the last four of the competition as she netted a near double-double of 19 points and 9 rebounds, along with 2 steals and 2 assists. There is no stopping January’s Molten Player of the Month who continues to dominate. 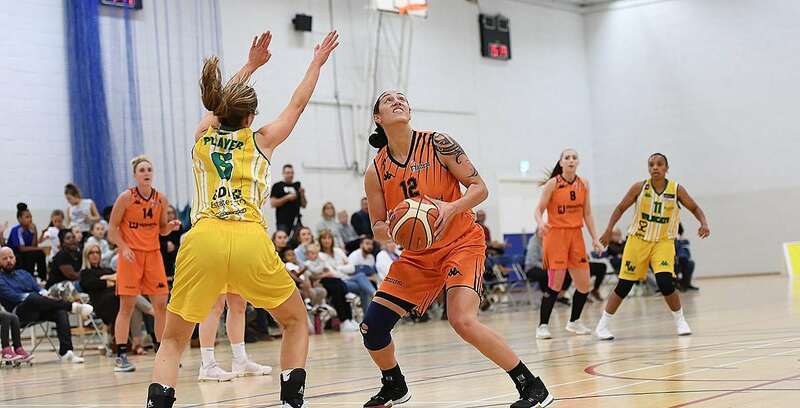 Toeaina propelled Hatters to the brink of the Trophy Semi-Finals by taking down Nottingham Wildcats with another jaw-dropping line. She made 71% from the field for 26 points, pulled down 9 boards and dished up 5 assists to become the first player to land 6 All-Star starting appearances this season. Off the bench – Loren Christie (BA London Lions), Jasmine Joyner (Nottingham Wildcats), Robyn Lewis (Cardiff Met Archers), Kara Bonenberger (Newcastle Eagles), Alix Henderson (Caledonia Pride), Georgia Jones (Manchester Mystics),Chelsey Shumpert (Nottingham Wildcats).